The government announced recently that £80 million was to be given to improve the implementation of the SEND reforms. £38.5 million is for local authorities to tackle the areas where problems are still being encountered such as training, communications, culture change and so on. Each LA is different and so has experienced varying degrees of success and challenges in bringing in the reforms. It all seemed like "a good thing" and indeed, it is. However, there wasn't a lot of detail about where the LA money would be targetted, so I asked the DfE SEND team for more details. Debs also asked you what you'd spend it on last week. Your responses (that Debs will be writing about soon) show you've had some fab ideas that could really make a difference. I'm sure you're looking forward to reading them all. The amount of DfE grant varies from LA to LA, as can be seen on the breakdown of the grant for local authorities and Boyes Turner have done an analysis of how much it works out at per child or young person with SEND. They're calling for the criteria for allocation to be made public as at the moment, the reasoning for how much each LA gets is far from clear. Where will the SEND implementation cash end up? You might be surprised! 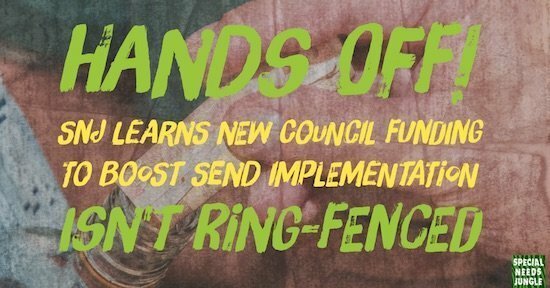 Last week, I heard something very worrying - this SEND implementation money from the Department for Education to local authorities ISN'T ring-fenced. This means it can be spent on pretty much anything that the LA wants - even non SEN-related items such as roads maintenance! The DfE has no power to make them spend it on what it is intended for - a council can write cheques from the SEND money according to their own local priorities. I'm told this position has been the case for some time, and although no one is saying LAs would do such a thing, as the cuts bite, council leaders may have their eyes on the incoming monies! One LA is planning to spend the lion's share (if not all) of its very large allocation on something that should come out of its main SEN budget, rather than on much-needed improvements to its fledgeling, reformed system for parents and children. At least it's still within SEND. I would like ALL local authorities in England to make public what they are intending to spend their SEND grant allocations on, when and why. Because as far as I'm concerned, their first priority isn't to shore up their own budgets with this vital money, it's to spend it on making the SEND reforms into what they are bloody well supposed to be - a real chance for our children to reach their potential, whatever that may be. 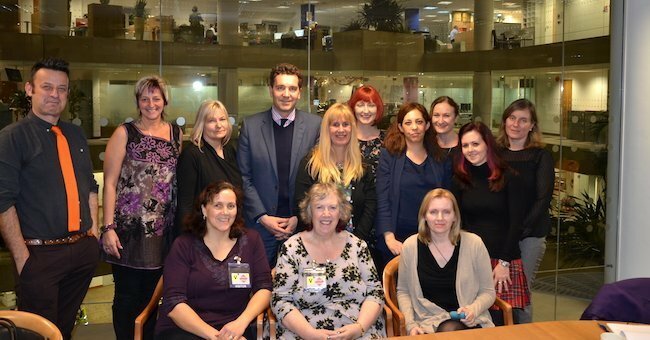 This LA funding boost is partly, I have no doubt, as a result of the meeting at the DfE last December between the SEND Minister, Ed Timpson, and parent carers from the NNPCF, the CDC and myself from SNJ. We explained the issues that parents were still facing and Mr Timpson took our concerns seriously. I don't know if the DfE gave any guidance to councils on what to spend their allocation (even though they have no authority to enforce it). I hope, however, that the Department's SEN Advisors dotted around the country will have something to say to councils about what is expected. What can we, as parents, do? We may be worrying unnecessarily, on the whole. It may be that most local authorities will do the right thing. But if we have knowledge of it happening in one LA, the chances are it won't be the only one. So, what can you do? Parent Pressure works - we know this. So it's time to make our voices on this issue heard. I would recommend emailing your local councillor; the council leader; the head of the committee that deals with SEND; your LA's Director of Children & Families and your local MP (one email, just cc them all if you can). Early this month, the Department for Education allocated [SEND_implementation_grant for your LA_2016/17 Click to reveal so you can add the right number] to [YOUR LA] to improve its implementation of the 2014 Children & Families Act. As a parent of a child with SEND, I am very pleased that the DfE has acknowledged that nationally, the reforms so far still have a long way to go before they make a real difference to families. This money, allocated to local authorities' SEND Departments, is intended to boost this process. I imagine the DfE expects it to be spent on, among other things, improving training for key professionals involved with disabled children, so that much-needed culture change can be furthered. This includes learning how to co-produce with parents. Perhaps some could be spent on making Local Offer sites more comprehensive. Or perhaps some could be ear-marked for improving communication systems so that practitioners from Education, Health and Social Care can more efficiently ensure that the EHCP process is as painless as possible for families. Other ways to spend it could be SENCo training and training teachers how to identify SEND in a child and what to do about it. Sadly, they have very often not already been taught this and so, as every teacher is supposed to be a teacher of SEND in the new system, additional training would be a very good idea. As new assessments such as Education Psychology, Speech and Language and Occupational Therapy, are often required when moving children from statements to EHCPs, or for new entrants, sourcing more professionals to carry this out would help ensure that children's needs are identified and outcomes are met. I am very concerned, however, that this grant allocation from the DfE is NOT ring-fenced and might be spent on other things unrelated to SEND implementation. While there is nothing in law to prevent this, as a parent carer, a tax-payer and a voter, I would very much hope that my local authority spends this money in the spirit and on the things (such as I have detailed above) that the Department of Education has intended. Parents have worked very hard to help the SEND reforms take place and it is now at a crucial point in time where initial changes must be bedded in and followed through. Only if this is properly funded will our disabled children and the coming generation of children and young people with SEND, have a chance to grow up and take their place, to the best of their ability, as contributing members of society. I am asking you to make public what your plans are for this implementation money and for your guarantee that xxxxxx council will not let local SEND families down by allowing this funding to be spent elsewhere. If you do send this - or your own version - to your local councillor, MP, council leader or Director of Children's Services, please let us know in the comments! The links are incredibly simple to follow. I have copied to our local Councillors, Mp, Headteacher, EHCP caseworker, Local Chief of children services Stuart Gallimore. for starters! Thank you for such a well planned and executed article. Once again SNJ comes up trumps!! Thanks, Elizabeth, and well done for adding your own take- that’s so important. I also personalised mine. It’s ridiculous that councils can receive this money “for” something and yet it’s possible to spend it elsewhere, at our children’s expense. Let’s hope it might have some effect if more than just you and I do it!